There’s just something really fun about any card with interactivity, right? 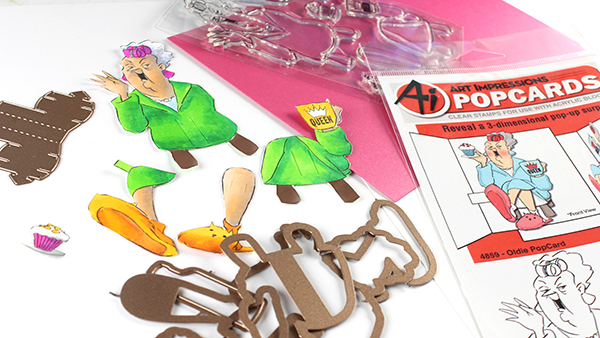 I saw these darling “pop cards” at CHA at the Art Impressions booth and thought – I gotta make some! Fortunately they gave me the set so I could try them all out, and give you some tips. These aren’t for the faint of heart – but are SO worth it. Watch the video below or click HERE to see it in HD on YouTube. Read the directions. Yeah, honestly. Most of my challenges were from assuming I knew what it said, then I went back and read it again when it didn’t work. Ahem. 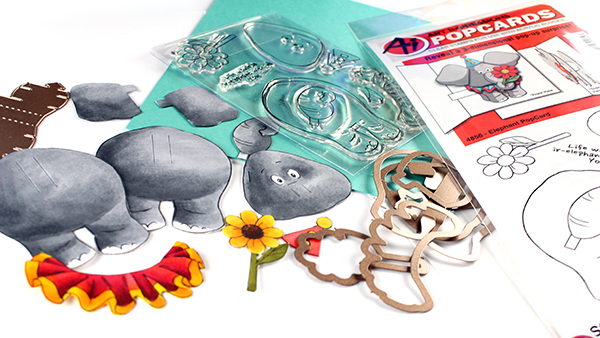 Each stamp and die set ALSO NEEDS THE POP CARD TEMPLATE DIE. Don’t miss out on that step. It’s sold separately. 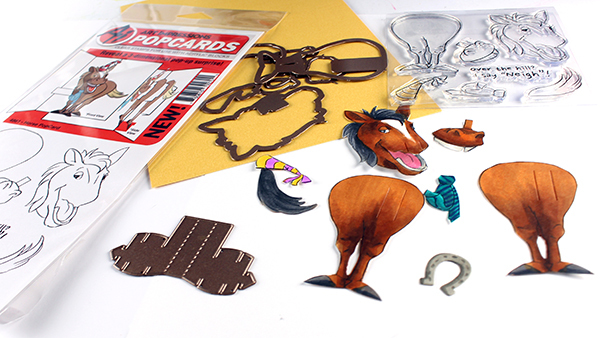 Stamp the pieces and die cut them, THEN fussy cut if you want to lose the white outlines. 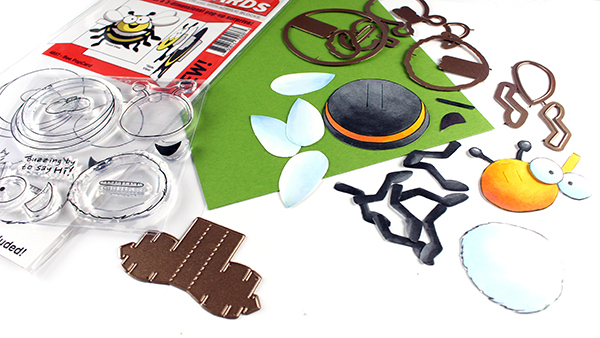 Don’t fussy cut first – you need all the diecut slits to assemble everything. Use good heavy cardstock, especially for the pop card template. Choose a color that will look ok when visible – ie for a green gator, don’t use pink, because you’ll see it a little bit. Practice once – cut two of the pop card templates, and attach everything to the first one – usually the first one I did wrecked the fibers of the pop card template cardstock, and it was challenging to keep it from crumbling; but once I did the first one, the second one slid into the slots a lot easier. When getting to the third piece with the little arrows, secure them with a power tab to both hold them in place as well as whatever the top piece is going to be. 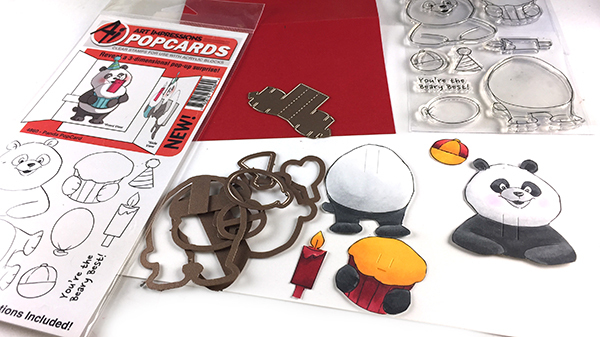 Below are pictures of the pieces, all cut out and colored – that took me a bit to work out for each one, so I save you the thinking at least a little. Panda —- Definitely the easiest of them all, I think. The shapes are really easy to trim. Yu could put all kinds of things in his paws, just cut out the little hands from the cupcake to add them to whatever you want him to hold. 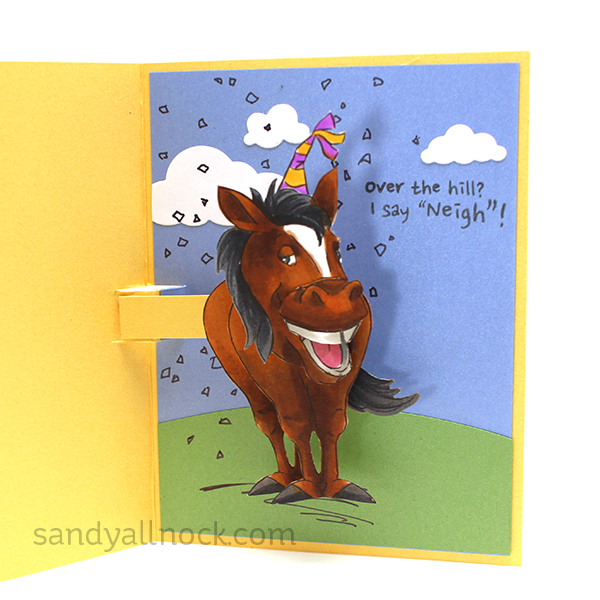 Horse —- Got to love a horse on a card, right!? Use dark colors for the mane and you don’t have to fussy cut all that hair. Gator —- probably my favorite, since his little arms are up in the air! He’s so happy. 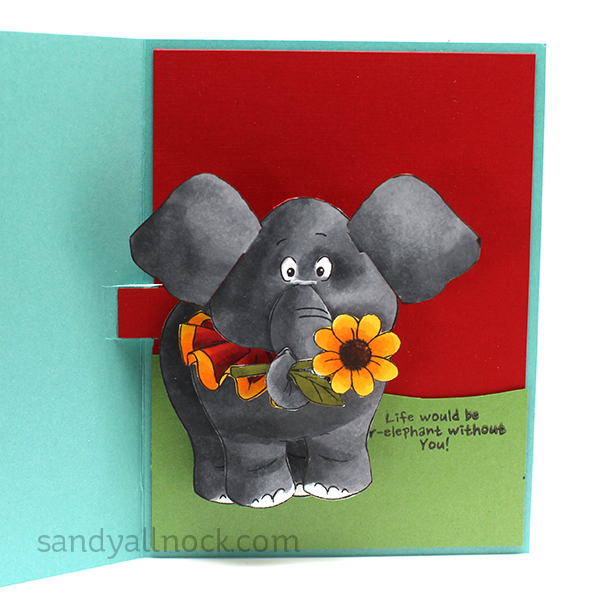 Elephant —- If you leave off the skirt and flower, this one is super easy to fussy cut! And a tip on the ears – since there’s no stamp for it, I ran my dark marker around the edge to create an outline so it would match the rest of the elephant. Bee —- Definitely the toughest to work out the details on – til you read the instructions. LOL. Cut lots of legs and wings (no stamps for them), and I think the piece I used for the stinger is the stinger – there wasn’t any instruction on that piece! I’d also stamp the mouth on him instead of gluing it on, though I think the same shape could be used as a tail according to the picture on the package. Oldie —- This one has a cupcake for her to hold – or a wine bottle! You might also have other things you can put in her hand in other stamp sets. I used the dark pink card base for the pop card template, and I think next time I’ll look for something more flesh-toned so it won’t stick out so much. But those slippers. Cuteness! Do you love Interactive Cards? Check out this page for more on this blog. The horse is my fave. I hope you post the fronts so we can see…even if it is just on IG or FB. These cards are fun! Gator’s my favorite too. Well done! An engineering miracle! SO CUTE and useful for adults the same as kids. Thanks! Oh my, how sweet are these, I love them all. 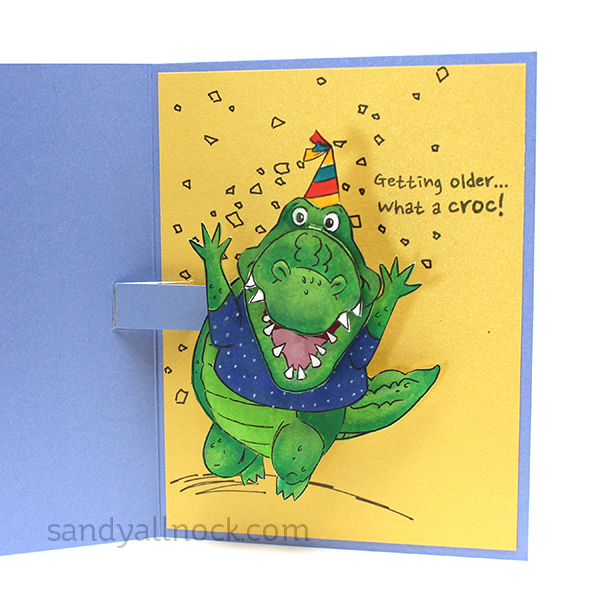 Great cards Sandy! I agree with Laura on the assembly of the arm. That’s how I understood the directions as well. Your coloring is, as always, perfection! Your comments on putting these together were affirming. Yes, thick card stick and no less than two of the pop up dies! 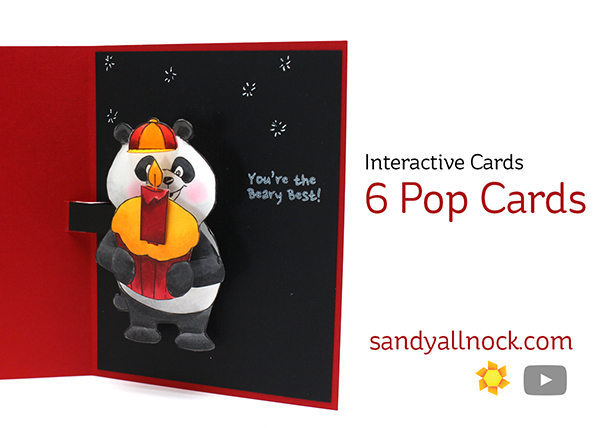 Oh Sandy, these ‘pop’ cards are the most adorable ever!!!! What fun! 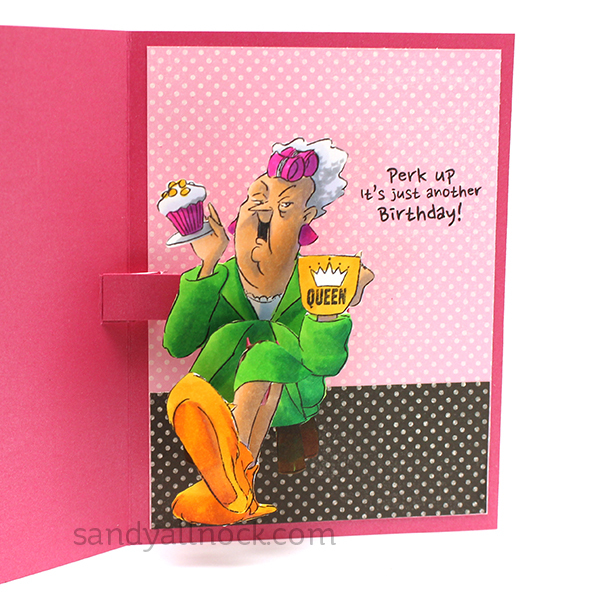 Great cards, Sandy. I think if you connect the back piece of the animal/figure (the piece that all of them use) to the inside of the card the animal/figure actually moves more and pops up better. 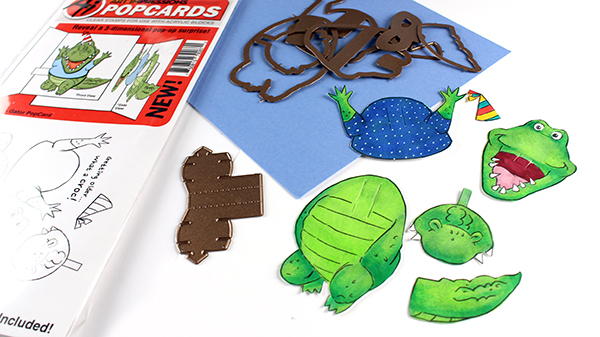 The “arm” that you cut to attach to the notched part in the card still attaches to the animal/figure the way you have it, but then it’s anchored to the actual card. That’s what I’ve seen in other videos, at least. Don’t think that would work since it has to actually move. Gluing it down would secure it flat. I got the 20% discount also…Good for me, bad for my bank account!